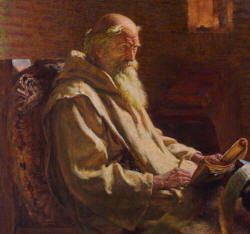 THUS much have I written concerning the Holy Places, following, to the best of my knowledge, the truth of history, and in particular the dictation of Arculph, Bishop of Gaul, which Adamnan, that priest so learned in Holy Scripture, hath set down in his jagged style, and comprised in three books. For the above-named bishop, from a desire to see the Holy Places, left his native country and went to the Land of Promise, where he stopped two months at Jerusalem, having an old monk, named Peter, for his guide and interpreter. He then with great zeal visited every thing all round, which he had longed to see, and travelled to Alexandria, Damascus, Constantinople, and Sicily. On his way home, the vessel in which he sailed, after much beating about, was carried by contrary winds to our island, that is, to Britain; and Arculph, after certain hazards, came to the above-named venerable man, Adamnan, and explained to him his voyage, and what he had seen. Adamnan was thus enabled to compose a most beautiful history thereof. From this book we have gleaned a little, and having compared it with the books of the ancients, have sent it for your perusal, beseeching you, by all means, to relieve your worldly labours, not by indolence or licentiousness, but by holy reading and earnest prayer.